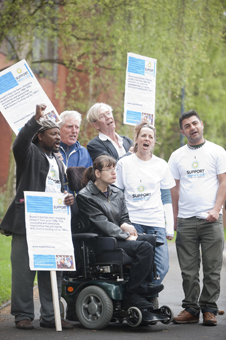 Last month Birmingham based Sound It Out, a ‘social development agency’ that develops music programmes for the city’s ‘marginalised individuals and communities’, had 100% of its Arts Council funding cut. A total of £100,000, referred to by the organisation as their ‘core funding’. In immediate response, local music promoter and entrepreneur Clare Edwards began a campaign to reverse the decision, citing Sound It Out as ‘a crucial organisation that uses music to achieve significant results for the hard to reach’. Edwards began her campaign with an online petition, but then mobilised support into a ‘singing protest’ outside the Arts Council’s office on Granville St. Supporting the Sound It Out campaign on Granville St was Birmingham based music consultant John Mostyn. ‘(Sound It Out`) literally effect the lives of people on the fringe,’ said Mostyn, ‘bringing light to those stuck in the darkness’. Sound It Out has a portfolio of success working with mental health issues. Sound It Out were amongst 21 regional arts organisations that lost 100% funding in the Arts Council’s national review, including other music groups Black Voices and Birmingham Jazz. Seven previously unfunded organisations were included in the new national portfolio, including Performances Birmingham LTD, the charity manages and runs the Town Hall and Symphony Hall.